The two girls were running for their lives, and they knew they could not run for very much longer. They were almost at the end of their strength, and the sounds of the pursuit was louder - the whistles, the shouts, the baying of the death hounds. “Not if we keep running,” Shon told her. Behind them the sounds were louder and the lights were bigger. The guards were gaining on them by the minute. “I can’t,” Lessie screamed. “It’s no use.” She grabbed her friend around the shoulders and hugged her tight. They stood there in the darkness, the wind whipping around their cotton dresses, and they came as close as two girls who knew nothing about gods could come to praying. And whether it was the gods they didn’t know existed or just sheer dumb luck, the prayer they were almost making was answered in a way they could not have begun to imagine. They clung to each other in terror and fear as the dark, starless night on Decas faded away to be replaced by a brightly lit room that appeared around them. It was a strange, frightening room that did not immediately reassure them. There were organic looking, branching pillars that looked like petrified trees and a huge domed roof like an upside down cauldron with round lights all over it. In the centre of the room there was something like a computer would look if it was grown instead of built. It glowed with an eerie green that threw its reflection onto the faces of the two people who stood by the machine making them look frighteningly alien. Lessie screamed once and fainted. Shon sank to the strange, metallic floor with her and sobbed in fear, hiding her face from the terrifying strangers. “What?” Shon looked up. Away from the glow of the machine the stranger’s face was not so frightening after all. It looked kind. His eyes were a soft brown and they twinkled as if he was laughing, even though his mouth looked solemn right now. Lessie was starting to come around again. She shrank back from the stranger, but he reached out and touched her face with his hand. At once her frightened expression changed to one of serene calm and when he went to lift her she reached out her arms to him. The Doctor looked at the girl in his arms and the one who watched him with suspicious, rabbit like eyes, expecting him any moment to inflict a sudden act of cruelty upon her. They both looked about sixteen or seventeen - Stella’s age. But the one in his arms was so light he hardly felt her. Stella was a slim girl, careful about her figure, but she had weight - the right weight for her age and height and bone structure. He would feel her if he carried her. But this girl felt at least half Stella’s weight, and that was only the first thing that was wrong with her. The other girl cried out in fear. The Doctor looked at her, then the view of the mob approaching with torches and guns and attack dogs and he nodded to Stella. “Take us into temporal orbit, please - the way I showed you. Then we’ll ALL have breakfast.” At that he turned and strode away towards the inner door, carrying the girl who felt like a rag doll, the other scurrying after her, refusing to be parted from her friend for a moment. Stella performed the relatively simple operation The Doctor had taught her and smiled in satisfaction as she looked at the view of the planet from temporal orbit. It was not a pretty planet. She had seen lots of really BEAUTIFUL ones already in her travels with The Doctor. But this one was ugly. It had no seas of any kind. The lowlands were black as if nothing grew on them at all, while the mountains were sharp peaks that reminded her of the way Transylvania was depicted in Dracula movies. She was glad they were away from that horrible planet, though she had a creeping suspicion they would be going back. The Doctor had a look in his eye. Something was happening and he would want to find out about it. She sighed and turned to follow The Doctor to the kitchen. Given the choice, she would have taken the two ragged girls to the medical room and possibly to the bathroom first, but he had decided they needed food more than anything else. He was sliding omelettes onto plates as she came into the kitchen. Four omelettes on four plates. She had seen him do that before. He sort of ‘re-used’ the time it took to make ONE omelette. You saw him beating the eggs, pouring them into the pan, and then there would be a sort of shimmer and there was one omelette already on a plate, and another one just cooked. Then when you blinked there was a sausage, a slice of bacon and a grilled half a tomato on each plate and the last omelette was being slid out of the pan. He turned and served the two girls first, then Stella as she took a seat next to them. Then he sat himself and ate. The two girls looked at him as if they needed his permission to start. He smiled and nodded and offered them the plate of bread and butter that had also been made in the same ‘re-used’ time. The girls took some of the bread and began to eat their breakfast hungrily. The girls slowed a little - enough to actually taste the food as it went down. But they still looked like people who hadn’t eaten anything for a long time and their last meal had not been enough to satisfy them. They looked as if they had NEVER had a meal that fully satisfied them. Stella tried not to stare, but she couldn’t help it. They looked like the pictures she had seen in her history books of the western women and children imprisoned by the Japanese during the Second World War. People who had been on very short rations for years, with little or no medical care. They were thin. Their eyes looked too big for the sockets. Their hair was cut short and looked lifeless and unhealthy as if shampoos and conditioners were unheard of. They were grubby and sweaty from running, but beneath that their skin had a yellow tinge that just couldn’t be normal. Stella knew there WERE people in the universe with yellow skin, blue skin, purple skin. This was the sort of yellow that went with the word jaundice and suggested something not right with the body. She saw The Doctor looking at her. He nodded, and she knew he knew everything she was thinking. She was pleased to realise that he approved of her assessment. She had thought it through well enough. Shon stared at the stranger called The Doctor. He hadn’t asked them who they were, or why they were running. He had given them food. Now he talked of showers and clothes and medicine. Stella looked at the girl curiously, then back to The Doctor. He was smiling serenely. He really DID look like an angel. She could well believe it. She had never thought of angels wearing pin stripe suits and plimsolls before. But now she did. “Is it true?” Shon stared at him in amazement and with new eyes that seemed to see him afresh, without the fear that was within her before. Stella took the two girls while The Doctor put the kitchen plates in the sink and then went to the medical room. When they arrived there, a little later, he was ready and so were they, clean and dressed in warm flannel pyjamas. He carefully examined them under the body scanner and found that Shon was healthy enough apart from being malnourished and overworked, but Lessie was suffering from mild liver damage and might also prove to be diabetic. The Doctor started her on medication for both problems. Stella helped him prepare medicines in a way she hadn’t seen for a very long time. Instead of injections, he was putting it into sugar lumps like they did when she was at infants school getting vaccinations. The Doctor nodded and said nothing as he turned back with his prepared medications and gave them to the two girls. When they had swallowed the sugar pills he helped them to lie down in two warm, comfortable beds and in a very short time they were asleep. “Then you’ll explain what this is all about?” Stella asked hopefully. The Doctor again said nothing. Stella followed him back to the console room and did as he instructed her as he programmed their new destination. “It means Potential Criminal.” The Doctor answered, beckoning her to join him at the computer database. On screen was a picture of Decas, the planet they had left behind. The screen changed to a series of views of one of its cities under a protective dome that made it almost invisible from space – no wonder it looked so desolate. The city looked, to Stella, like a very clean and tidy shopping mall. The people looked as if clothes stores weren’t a regular feature of that mall. They all wore the same ‘uniform’ of loose cotton trousers and jerkins in combinations of white and blue or green or yellow. They didn’t seem to talk much as they ate their meals in big food courts and then returned to their jobs. When work was over they went to big dormitory places where they slept in large rooms that were, again, very neat and tidy. Regimented was the word that came to Stella’s mind. That one word, EXCEPT, was loaded with meaning. Stella knew there was more to come, and it wasn’t going to be pretty. The screen changed again and she looked at a building that in any culture had to be a prison. The exterior was grim enough, high stark walls of grey stone, almost no windows, and those barred. A high wall surrounded it, enclosing grey paved yards with guard towers and searchlights. “They don’t CALL it that. They call it the ‘institution’. It is Decas’s solution to crime. At the age of twelve, all of the children in their school are tested with various psychological tests. Something like a Rorschach test, a questionnaire, fast reaction response test. And from these tests they determine if these children who have spent their whole lives up to now living in communal dormitories, learning prescribed lessons to equip them for life as a worker in Decas society, with barely any time for prescribed leisure activities, might grow up as deviants – as criminals who might upset the balance of society. Those who are determined to be Potential Criminals are brought to the Institution for ‘correction’. Stella looked at the pictures of the ‘Institution’ and shivered. “Because Lessie and Shon hardly look like they’re being given tender loving care,” The Doctor answered. “The ‘Institution’ is there to punish the ‘Pota-Crims”. “But….” Stella thought about herself aged twelve. She had not been a bad girl, but she could be a bit selfish and demanding. She had been mean to Wyn sometimes and jealous of her brothers’ children, but she had not really done anything wrong. Even later, when she was at the age when some children did go astray, she had never done anything bad. She had never hung around in a gang, never smoked a cigarette or drank alcohol except at family dinners and parties when she would have been allowed a half glass of wine or a cocktail that was mostly orange juice. She had never shop-lifted, even though at fifteen or sixteen it was regarded as a sort of rite-of-passage by a lot of the girls she knew to slip some small item into their pockets without paying and get away with it. She had been as good as she knew how to be. But even so, she wasn’t sure she would pass a test at the age of twelve that was aimed at determining if she MIGHT commit a crime in the future. After all, ANYONE could potentially commit a crime, couldn’t they? No, he thought briefly. They didn’t. When they saw a child like the one who grew up to be The Master, when they knew he was only this side of sane, when they saw the cruelty in his eyes, the ruthlessness in his soul, they tended to look for ways to use that ruthlessness to their advantage. They didn’t exactly ENCOURAGE it. They didn’t train and hone his dark soul. But nor did they attempt to rehabilitate him. He wondered what they might have seen in the boy who would one day be The Doctor, too. He wasn’t ruthless by nature, though he HAD been ruthless at times in his life. He wasn’t cruel. And he wasn’t disloyal to his race, to his world. But they must have seen, even when he was a youngster, that he was not going to conform to the unquestioning, stagnant race that Time Lords had become by the time he and The Master in their separate ways rocked them out of their complacency. They must have thought, about him, too, how they could use his uniqueness for their advantage. And so they didn’t try to rehabilitate him. What they didn’t plan for was what would happen if they couldn’t control their aberrations. The Decassians did. If he and The Master had been subjected to their tests as boys, the Decassians would have built a SPECIAL wing of their institute just to hold the two of them in. “Yes, it is,” The Doctor agreed. The Doctor said nothing in reply, but he smiled at her in such a way that she knew she had said the right thing. She ran off back to the medical room as he turned again to his console and fine tuned their course, shaving a few minutes off the arrival time. He sighed. The Angel of Decas had brought hope, brought deliverance to so many like Lessie and Shon, but there were so many more. In a way, his efforts on that planet epitomised the problem he faced across the whole universe. Every young person he saved from Decas was just a drop in the ocean of the problems that planet had. And every planet he saved from despotic rule, every time he defeated Daleks or Cybermen, Sontarans, or any other fiend, there was another, and another, and another. His work was endless, and sometimes even HE despaired. But he couldn’t show it. He was the one the others looked to, depended on. He was their rock, their strength. He had to be strong. But who did HE turn to when he needed a shoulder to lean on. The communications console bleeped and he smiled as he saw an incoming communication from fifty-first century Earth. “Argues about what?” The Doctor asked curiously. The Doctor laughed. Then Wyn looked at him seriously. He smiled softly. Wyn had answered his earlier question. Who did HE turn to when he needed a shoulder to lean on? He turned to her, and to Stella, and to Jo and Cliff or any of his friends. They would always be there. He talked to Wyn for as long as he could. It was nice to hear from her. He was glad she was happy. But he missed her around the TARDIS and he hoped she wouldn’t mind coming back at the end of her stay with Jamie in the fifty-first century. He felt a lot better for seeing her. He smiled as he set the TARDIS for the final approach to the planet called Cie’lo and went to rouse the two girls and get them ready to see their new home. “You soppy thing!” Stella teased him. Then she turned to look at Lessie and Shon. They were wearing dresses and shoes from the TARDIS wardrobe and sunhats over their short cut hair. They actually looked like real girls instead of half-starved pigeons. They were smiling with delight as they knelt to touch the cool grass beneath their feet and looked up to feel the blue sky and warm sun on their faces. Stella looked at the ornamental footbridge over the river and the village beyond. It was a dream of a village - like the designer of Port Merion had been given twice the budget and a whole boatload of sculptures and pillars and ornamental fountains. “Come on,” The Doctor said to Lessie and Shon. He took hold of their hands as they walked towards the bridge. A small crowd of people were coming from the other side. They were all quite young, none of them more than about forty five, and they were smiling and happy as they called out to The Doctor. He rattled off a dozen more names. Then Lessie and Shon gave a stereo shriek of excitement and broke free from his grasp. They ran towards two girls only about a year older than them who they greeted as Florinda and Janessa. Meanwhile The Doctor moved slowly towards one of the older people, a man who he called Kossen. The FIRST one he had rescued. They hugged like old friends. “Two more for you to take in,” he said to Kossen as they walked over the bridge to the village. In the midst of all that colourful Italianate architecture was a village square with coloured paving slaps broken up by flower beds and fountains. The centrepiece was a big rectangle contemplation pool with a simple fountain of water spouting up in the middle. It caught Stella’s attention at once. The Doctor, she noticed, didn’t look at it. She wasn’t surprised. Not many people could take being depicted in a mosaic in the floor of a contemplation pool. There were ten figures in a row picked out in coloured marble mosaic. Stella recognised four of them. The Third was the one her mum had pictures of in a family album. The Fifth was the one she had met a little while ago. The Ninth was the one Wyn adored and who had been an occasional visitor to their home since she was little. 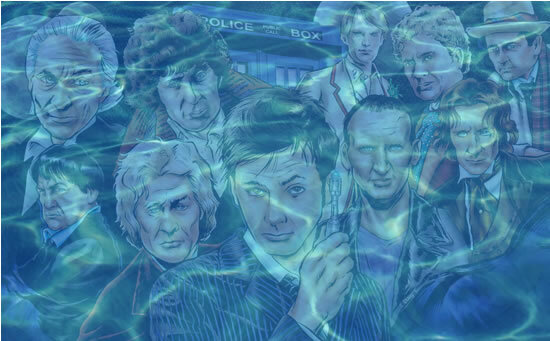 The Tenth was her own Doctor, smiling enigmatically beneath the clear water. He had been rescuing young people from Decass and bringing them here since his first incarnation when he travelled as an old man and his granddaughter. Each of his regenerations had continued the effort. Each of them was known to the people of Cie’lo as the one who had saved them. She sat by the pool and watched as The Doctor and Kossen arranged for Lessie and Shon to be taken in by two of the older people, a man and a woman who had two young children of their own. There were other children around the square, playing happily. She remembered what The Doctor had told her about how babies were born on Decas. Obviously it didn’t take them long to work out the usual way to do it. “I have the strangest feeling you’re going to tell us you have a plan,” The Doctor said. The Doctor looked at Stella. He could have told her she was seventeen and from Llanfairfach, and what did she know about it. But he didn’t. She had put her opinion forward. She was entitled to be heard. And it was a fair point. “Let’s hear the plan,” he said and turned sideways, one leg up on the pool side, his elbow on his knee and his hand under his chin. He listened to the plan. He saw that they HAD thought it through. They had bought weapons from their trading partners, as was their right, of course. He wished they had not, but he could not stop them. They had trained themselves. They had formed a plan that could, actually, work. He called himself a pacifist. He refused to kill… unless there was no other choice. It was a strange definition of pacifism that had led to him killing on more than one occasion when he knew it was the only way to save innocent billions. He rarely killed with conventional weapons. He had not fired a gun in anger since the Time War. Instead, he killed with trickery, with things that most people would not see as weapons. But, yes, he had killed. He could not claim to be innocent of that. If he said he would help, then Decassian and Cie’lon blood would be on his hands. His soul would have their deaths seared into it. But Stella and Kossen were both right. As much as he could do, and always would do, it was only piecemeal. Maybe it WAS time to act, once and for all. There was a party that night to welcome Lessie and Shon to their new home. It was a happy party, and the two girls looked as if they were going to be quite all right. Lessie even danced with a boy, and both had lost the scared, hunted look. At the same time, there were preparations for the morning. The message went out to the other villages and the young people who made of the militia arrived. They didn’t wear a uniform. The world they escaped from had uniforms. They were free. As the party died down, The Doctor still sat by that pool that he still didn’t look at and wondered if he was doing the right thing. There was no turning back, of course. He had to do this. Perhaps he SHOULD have done it long ago. When he first found Kossen, and knew what was happening on that planet, he ought to have destroyed the psychoanalysis machines that condemned the children and pulled that foul institution down brick by brick. And why didn’t he? Now he DID turn and look at the images of his past lives. He looked at the image of the bitter old man who had made himself an exile from his home because he believed that the universe needed somebody prepared to interfere in it to make it better. “You got it wrong, old man,” he whispered. “No.” He was startled to hear the voice inside his own head. A voice he recognised. His own voice as it was then. The careful accent of a Gallifreyan aristocrat. It took him several regenerations to lose that accent. It seemed to be the last vestige of his real origins. He felt strangely alone in his own head after that surreal moment had passed. He’d never really talked to himself before. Perhaps he should try it more often. “Will you be here when we wake?” Lessie asked. “I am?” Stella looked at him with the same expression Jo used to have when she was about to argue with him. It was partly that and partly because the TARDIS was going to be a troopship carrying an armed militia, and if his conscience could justify that it could not justify bringing Stella along as well. Lessie and Shon kissed him on the cheek, too. Then the three girls went to the house where they were spending the night. The Doctor stayed by the pool. He didn’t really need to sleep the few hours until dawn. 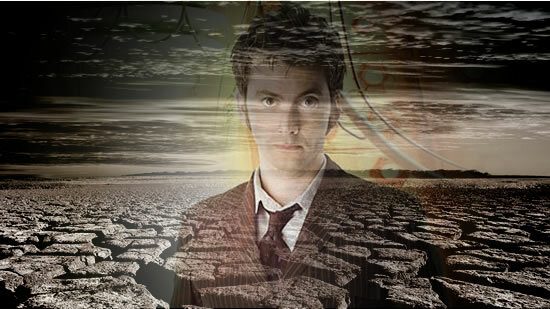 He spent the time thinking the slow, deep thoughts of a Time Lord. Thoughts about the universe as a whole, because only a Time Lord could think about it as a whole. Only a Time Lord could fix the universe in his mind without being overwhelmed and frightened of it. The dawn came up and the militia gathered in the village square. The Doctor looked at them and wished once more than there was another way. They all looked far too young, far too inexperienced. A few people came to watch them leave. Most didn’t. Either they didn’t understand what it meant to go to war, or they did and they didn’t want to watch them go. “Come on then,” he said in a quiet tone that was, nevertheless, heard by them all. He walked across the bridge, and they followed him. He tried not to think that he was a general leading an army. There were a hundred of them all told. Kossen himself led them. The Doctor brought them into the TARDIS and through the console room to the dojo he and Wyn worked out in. It was a comfortable enough place for them to sit until they reached their destination. “Yes,” The Doctor said. He looked up at him and his gaze fixed on the gun Kossen was holding. The militia all had the same weapons. He took it from him and examined it carefully. He was surprised to see it was a sort of energy ray gun that dealt a painful and incapacitating blow to the opposition. “Doctor,” Kossen began to say something else, then stopped. Kossen had no reply to that. But long ago, when The Doctor had a different face and he had been that frightened boy, he had put his trust in him. He still trusted him now, even though The Doctor didn’t seem to trust himself. The plan WAS a good one. The Doctor admitted that much. They had thought it through for a long time, waiting for him to come back and give them the opportunity to put the plan into action. There were two parts to the plan. One half of the militia were going to the institution - a rescue mission. The rescuers got ready, standing in a ring around the console room, facing outwards. The Doctor materialised the TARDIS in the middle of the main wing of the institution, a huge, glass roofed room with barred cells on three gallery floors, one above each other. The rescue militia were ready for that, some holding their stun guns at ground level, others ready to fire on the middle level, and others aiming high. The TARDIS was materialised only for a few seconds, hardly long enough for the guards to realise something was happening. Then it was gone and the militia were there, opening fire on the guards. The Doctor looked around and saw Kossen looking at him. He knew the expression on his face must have been a disturbing one. He could not have told Kossen what he had felt as the militia waited in the console room. Each and every one of them had been filled with horror as they prepared to be materialised inside the place of their childhood nightmares. They were afraid. Their fear overwhelmed his telepathic nerves and he felt it in the core of his being. He knew there was nothing he could do, nothing he could say to make it easier for him. And he knew, too, that nothing he could say would make any one of them change their mind. They were ready to face their nightmare head on. The Doctor thought he knew what courage was. But today he had just seen it redefined. “Get the rest of your people ready,” he said to Kossen. The TARDIS materialised again in a room that the militia found almost as horrifying as the Institution. Every one of them had passed through it. This was the room where they were assessed and branded as Potential Criminals and condemned to the Institution. Again The Doctor materialised briefly and deposited the militia. But this time he materialised again a second time, within the ring and he and Kossen stepped out. As he spoke, the militia were busy moving through the huge room, switching off computer units and detaching the probes that connected children to them. The children, twelve year olds, the age of assessment, were puzzled when they were told to run to the blue box that had appeared in the middle of the room, but obedience had been drilled into the people of Decas from an early age. They did as they were told. There wasn’t a room like that when he left Cei’lo, The Doctor noted with a smile. But there was now. Such a room was needed now, and the TARDIS responded to such needs. “You!” he commanded the scientist with a cold, hard look in his eyes. “Come here. Sit down at this terminal.” The man looked at The Doctor mutinously, but that cold, hard stare brooked no refusal. He walked slowly, stun guns on him the whole time and he sat in the seat. The Doctor nodded to Kossen and he put the probes onto the scientist and switched on the programme. A series of tests flashed onto the screen. There was no keyboard. No need to type anything in. The probes monitored the brain’s responses. The scientist had no choice but to answer the questions, respond to the stimuli. It went on for a half hour. When it was done, the screen went blank for a while, then flashed on and off as words appeared in the centre, big, bold and unmistakeable. Deviancy Detected. Potential Criminal. Deviant. Criminal. He sat at another machine and put the probes on his own forehead. He ran the programme. Only this time it didn’t take half an hour. It took less than three minutes as his mind raced through each test and at the end he was branded a Potential Criminal. He ran it again, and this time he was passed as a True Citizen and again, and again. Around him, all the machines turned on again and each one was running the programme at super speed. The Doctor was answering the test on each of the terminals and was either being branded or passed each time, apparently at random. Then one terminal exploded. Then another. Around him there were crackles and sparks and exploding VDU glass. Finally The Doctor ripped the probes from his head and pushed back away from the last machine as it blew up. He turned and headed to the TARDIS. The militia followed. The Doctor programmed another destination, outside the grim walls of the Institution. He opened the two doors wide and stood watching as the freed prisoners and the militia who had freed them came running from the prison, the great steel gates in the outer wall flung open as they surged out. The guards ran, too, but scattering in different directions. The children ran with the militia. There were casualties. Four or five of them, The Doctor counted, wounded militia, carried by their comrades, wounded prisoners who had been caught in the crossfire. Some of the guards, too, were having to be helped. But as far as he could see, there were no fatalities. He was relieved by that. It had been what he feared most. It was soon obvious why everyone was running. The Institution building was on fire. The Doctor knew that was part of the plan. They were going to raze the vile place to the ground. Even as they evacuated the building a red glow and rising smoke told of a thorough job of arson. There was somebody screaming. All of the former prisoners were terrified, of course. They had found themselves in the middle of a war. They had seen their guards cut down, the cells opened, and then they had been told to run. They had felt that the people telling them to run were on their side, but they were not sure. All they knew was that they were frightened. But there was somebody more frightened than all the others. The Doctor looked around and found the source of the screaming. It was a girl who looked very much like Lessie and Shon had looked when he found them, hair shorn, painfully thin, terrified eyes. And she was calling somebody’s name. “Who are you looking for?” The Doctor asked her. The Doctor looked. There WAS a tower on the building. It was dark and sinister against the bright sky. The fire had not reached it yet, but it was only a matter of time. “Nobody checked the tower?” The Doctor ushered in the last of the prisoners and sent them on towards the orange juice and places to rest then he ran to the console. He checked the lifesigns monitor. It showed him three lifesigns in the tower. As soon as the TARDIS fully materialised he ran to open the doors. There were two youths, one of them obviously Branni since the hysterical girl ran to him and hugged him tightly, proving that relationships were possible even in a place like the Institution. The Doctor stepped out and grabbed the third person. He was one of the guards. When the prisoners saw him they all murmured angrily, but The Doctor held onto him and wouldn’t let them inflict any harm on him. He set the TARDIS back down outside the institution and pushed him out. “All right,” he said turning to the crowd inside. “Everyone find a place to sit. We’re going on a long journey.” He dematerialised the TARDIS one more time and set the course for Cie’lo. The militia helped the former prisoners to come to terms with the fact that they had, actually, been rescued. As they stopped crying and murmuring with fear a different murmur began to be heard. 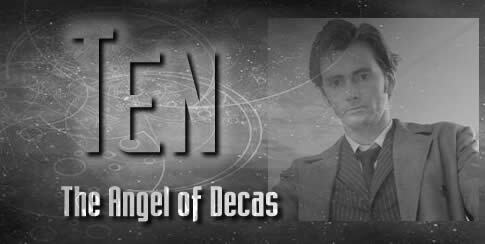 The word angel was in it, and they looked at The Doctor with wonder in their eyes. They had all heard the rumour, held onto a tiny spark of hope in their hearts. And now they were in the presence of the Angel and they were going to heaven, just as they had been promised. Cie’lo certainly looked like heaven to them as they poured out of the TARDIS doors and ran in the cool grass. From across the bridge people were running towards them. Some ran to take the injured on stretchers. Some hugged their loved ones coming back from the ‘war’. Others took hold of the former prisoners, holding their hands and asking their names. Some of them knew each other, some were strangers, but all were welcomed. All were brought to the village square and food and drink were brought and clean clothes for them to wear, casting off their prison rags and throwing them on a bonfire that lit up the night as a joyful and endless party went on. The Doctor sat by the pool again. He looked at the mosaic in the bottom of the pool. Then he took out his sonic screwdriver and dangled it casually in the water. “Wow!” exclaimed Stella as she watched the coloured tiles come loose from the floor of the pool and spin around in a cloud of colour before re-arranging themselves once more. “Wow!” she said again as she looked at the new picture they formed. The ten faces of The Doctor were there. But so were the faces of Kossen and Lessie and Shon and dozens of others of the former prisoners of Decas who came to Cei’lo. Their faces crowded around those of The Doctors and made them look less significant in the throng. Stella did so, and then the two of them walked quietly over the bridge, leaving the village behind them. They stepped into the TARDIS, a much quieter TARDIS than it had been for a while. “I know.” The Doctor sighed. Then he smiled brightly. “Next stop the mineral lakes of Kurhan?